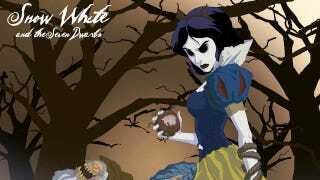 What if Disney's princess movies were horror stories? Disney's so-called princess movies are reworkings of myths, fairy tales, history, literature, and legend, but the series Seven for a Secret, written by an anonymous writer on the fanfic community Archive of Our Own (as part of Yuletide 2012) starts with the Disney versions of these stories and then twists them back into darker fables. In these brief tales, Jasmine loses her hand in the market, Belle is caught up in the French Revolution, and Rapunzel is immobilized by the weight of her massive hair. Top image: Crop from Jeffrey Thomas' "Twisted Princess" series. See all the monster princesses on his blog. There were some days when it was too much to get out of bed. For as long as she could remember, Rapunzel had struggled to perform the duties of daily living. She had vague memories of being able to play, but nowadays she was weighed down by the weight of the world, barely able to move. Mother visited her every day, bringing food and helping her dress, because Rapunzel was unable to do even the simplest task by herself. She was tethered to the ground by her hair. Sitting up was a fight against herself in the most literal sense. Her hair grew so fast that she couldn't keep up with it. Sometimes it felt like she blinked, and suddenly there was another foot of hair to contend with. She didn't know it wasn't common for people to have hair that would gain an inch a day, since she didn't have anyone to compare herself to except Mother, and Mother always looked the same. Once a year, she would drag herself over to the window to stare out at the lights that appeared on her birthday, wishing she was as free to drift away. There were times when she wanted to give up, to chop off the glorious healing hair that Mother claimed she needed to protect. She wanted to stand up, to go outside and meet people. There was nothing sharp enough in the tower to make that fantasy a reality. Mother was too cautious. Once, the day after her fifteenth birthday, she tried to pull her hair out of her scalp strand by strand, but it would not break. Mother had been correct about how magical her hair was. Rapunzel was a tiny thing, and her hair was anything but, heavy in a way she couldn't describe. Lying down all day wasn't healthy, but neither was trying to move her slender neck when hundreds of pounds pulled down upon it. Sometimes she felt like her neck would snap if she moved too suddenly. The constant headaches her hair caused were only alleviated by the medicines her mother brought. It became their final act of togetherness, with Gothel mixing Rapunzel a soothing draught to help her sleep and dream. Those days, she didn't bother to try to do anything, since it was more pleasant to sleep. Then one day, Mother never came. You can read the rest of this story and the other six at Archive of Our Own.